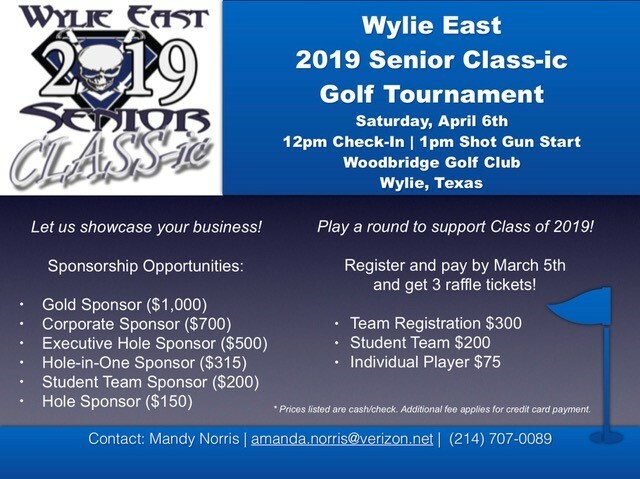 Thank you for supporting the Wylie East Class of 2019! Funds raised will be used to celebrate the seniors at PINSTACK and provide a gift to the school from the Class of 2019. Sponsorship Opportunities: Gold Sponsor ($1,000) Corporate Sponsor ($700) Executive Sponsor ($500) Hole-in-One Sponsor ($315) Student Sponsor ($200) Hole Sponsor ($150) Players: Team of 4 ($300) Student Team of 4 ($200) Individual Player ($75) * Please note all prices are based on cash/check. Higher prices for credit card payment due to fees required.